Patric Hornqvist went right back to the net where he feels most comfortable and was in his element once again. 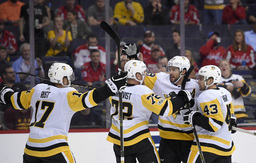 Hornqvist scored a power-play goal and assisted on another in his season debut to help the Pittsburgh Penguins beat the Washington Capitals 3-2 on Wednesday night in their first meeting since the playoffs. The Swedish forward who scored the Stanley Cup-clinching goal despite a broken finger and needed surgery to repair it, was on the ice for all three Pittsburgh power-play goals, naturally crashing the crease on each occasion as he's accustomed to doing. "That's usually where I end up being and where I get my points and like to be," Hornqvist said. "You have to play games to get better, and it was good to get the win and it was fun to be back out there." Hornqvist assisted on a goal by Kris Letang, the defenseman's first since Feb. 4 after missing the end of last season and playoffs because of neck surgery. He was also right there for Conor Sheary's goal as Pittsburgh went 3 for 6 on the power play. Alex Ovechkin scored his NHL-leading eighth goal of the season in the Capitals' fourth game. His goal with 7:09 in the third period made things interesting, but Washington's season-high six minor penalties dug too deep a hole as a third of the game was played on special teams. "It really didn't allow our top players to get going," coach Barry Trotz said. "Every time we started getting any rhythm, we'd get a penalty." Christian Djoos assisted on Ovechkin's goal and scored in his NHL debut to become the third defenseman in Capitals franchise history to score in his debut after Steve Poapst and Hall of Famer Scott Stevens. "First game in the NHL, and you get a goal and an assist," Djoos said. "That wasn't my plan really when I showed up at the rink. I was going to play good and play a structured game and detailed game, but happy with the goal and the assist." Pittsburgh outshot Washington 36-22 as Matt Murray made 20 saves for the victory while Braden Holtby had 33 in the Capitals' first regulation loss of the season. The Penguins also went 4 for 4 on the penalty kill. "We had a good game plan going in," Letang said of the penalty-killing success. "I think we did a good job of denying their biggest threat with Ovi on the weak side." Ovechkin was in danger of going without a point for a second game in a row after scoring seven goals in the Capitals' first two. Trotz was happy that Djoos made the play to set up Ovechkin's seventh even-strength goal of the season, and Murray was happy the Penguins didn't allow him to do any more damage. 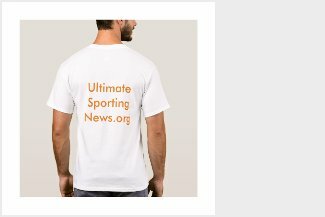 "He can score from anywhere," Murray said. "He's got a really tough shot to read as a goalie and you've got to be aggressive on him. But you don't want to be overplaying him either because then other guys can hurt you just as bad." The Capitals kept Sidney Crosby, Evgeni Malkin and Phil Kessel from scoring, as Crosby had just a secondary assist on Hornqvist's goal. But the Penguins' depth allowed them to mix and match when the power play wasn't clicking, and getting Hornqvist back makes a big difference for the defending champions. "He brings so much to this team," coach Mike Sullivan said. "He plays with so much swagger. He's just a great competitor." NOTES: Ovechkin's four goals are the most in his first four games during his 13 NHL seasons. ... Sullivan said there's no definitive timeline for the return of defenseman Ian Cole, who took a puck to the face Saturday and was placed on injured reserve. ... Pittsburgh scratched Scott Wilson to make room for Hornqvist. ... Washington scratched Taylor Chorney for Djoos and Aussie Nathan Walker for Tyler Graovac.